As I read The Maze Runner, I couldn’t help but shake the feeling that the story was meant for a video game instead of a novel. The Scorch Trials merely confirms my suspicions. I mean, who in their right mind would acronym their organization with WICKED? While the first book in this series had a pretty straightforward goal (escape the maze), the sequel made no sense whatsoever. OK, these kids escaped the maze, but then what? The idea of traveling to the “safe haven” seemed to come so late in the plot that it almost felt like an afterthought. Concerning the characters, the main ones are still there, but so many of the ancillary minor characters are so forgettable as to be practically useless. Brenda was added into the mix merely to elicit a “love triangle” between the two love interests of the first book, but it just felt forced . . . like everything else in The Scorch Trials. Survival doesn’t make for a great motivation unless there’s something to hope for in the long run. I never got much of a sense of any of the characters’ motivations since around every turn the world they found themselves in was trying to kill them in ridiculous and unbelievable ways. I think what turns me off about this series the most is that the “hand of the author” is obviously visible throughout. Nothing feels natural, and the exposition is spotty and done in huge chunks based off of a lull in the action instead of as a result of it. Each time the characters face a new challenge, there seems to be no weight behind it, since most of the “challenges” are basically to generate a conflict between the characters and the unseen organization while providing no new information as to what any of it means. 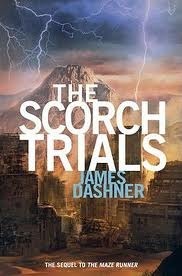 A book that should have been a video game, I give The Scorch Trials 2.0 stars out of 5.